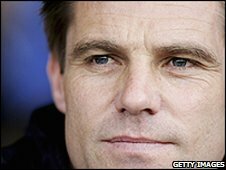 Southend United manager Steve Tilson says his players "ran themselves into the ground" during Tuesday's 1-0 home victory over Leeds United. The Blues moved up to seventh in the League One table and have won five out of seven home matches this season. Tilson told BBC Essex: "The front two [Alex Revell and Francis Laurent] worked their socks off. "I had to bring the two of them off, they had nothing left, you can't ask any more than that." He added: "Lee Sawyer's another one, I think everyone ran themselves in to the ground. Hal Kanu was out on his feet." Dan Harding's first half free-kick against his former club proved to be the winner. Tilson said: "Dan hasn't threatened too much from set-plays but he had two fantastic strikes from a dead ball, the first one's gone in and [the second forced] a good save. "There were loads of plusses, I felt we kept a good shape when they were in possession, which we had to do." The Blues now face Colchester United in an Essex derby at Roots Hall on Saturday. There will be full match commentary on BBC Essex 103.5 and 95.3 FM, with the show starting at 1200 GMT.